For the benefit of any readers here who AREN’T as old as dirt, I will tell you about this simple little game that was apparently developed by Lucifer himself in order to trap sad souls. Lemmings was a puzzle game made in 1991 or so for the little computers of that era who really did try their best. The “game” was occasionally used by middle school teachers in rural Ohio (and possibly other places as well, but I lived in a bubble back then much as I still do today) as a “reward” to students because it probably taught critical thinking skills and apparently also valuable lessons about humility, defeat, and frustration. The “lemmings” were so named because of the science-myth which teaches that lemmings are thoughtless herd rodents that will follow the lead lemming over cliffs and into the mouths of predators,. It certainly wasn’t called Lemmings because the characters in any way resembled actual lemmings. They sort of looked like Mokey from Fraggle Rock, actually. 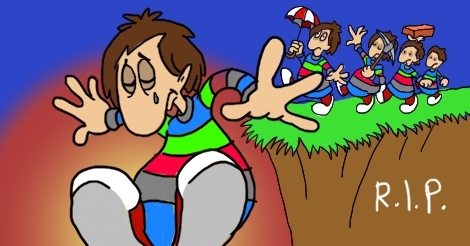 The lemmings’ world is a strange one where they are continually shoved into new environments where they need to be saved by you, the player. They plummet happily from a bizarre trapdoor in the ceiling, and then they just sort of walk in mindless rhythm until they die, are saved through some mysterious doorway, or are mercifully “nuked” courtesy of a decision the player has made. The levels, and I think there are a million of them, seem to be categorized as “fun,” “tricky,” “taxing,” and “mayhem.” Of course what these really translate to is: “boring,” “frustrating,” “impossible,” and “don’t even bother,” respectively. 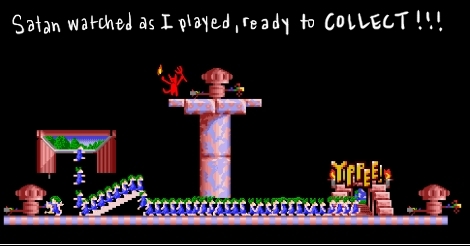 Sadly, I must admit that I have never fully completed all of the games in my little emulator here because it went from Boring to Frustrating much too quickly and after completing all of the “Tricky” levels, I had lost my will to live, and quite possibly, also my very soul. I am not here to actually review the entire Lemmings game (even though I just basically did). I am here to tell you of one specific level that caused me so much anguish that I came very close to having an aneurysm there on the spot. The level went by the name of “I Have a Cunning Plan” and was among those in the “Tricky” category. It was DAMN NEAR impossible and it made me want to die. And you know, it wasn’t THAT hard. You just had to build a little ladder to slow some of them down while one dug through the bottom of that pillar. But you couldn’t let any of them turn back because there was a meat-grinding torture device set up right there, eager for them to walk into it. You could put a little lemming on guard duty, turning them back before they hit the spinning blades. 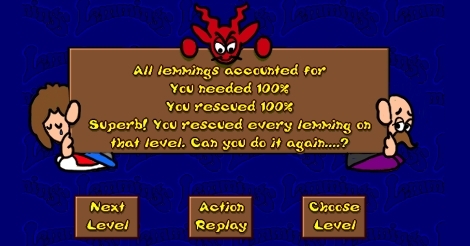 However, the catch was that you had to save 100% of the lemmings on this level. 80% wouldn’t cut it. Not even 97% would pass you, as I found out 900 times over the course of this ill-fated day. Amanda: I have tried it like 4574573456758 times and you have to save 80 out of 80 lemmings. Amanda: I am about to shatter. My fury knows no limits. They come out one after the other, as fast as possible. Very often, the thing I use to aim hits the WRONG LEMMING. It is ridiculous. Amanda: I don’t understand this. I could have sworn none of them died. NONE OF THEM! But it still says I only saved 97%! Billy: Are you turning on Linkin Park now? Amanda: I am going to End It All. I watched the Replay and one of them hit the step wrong and turned the wrong way. Billy: !!! How does that make you feel? 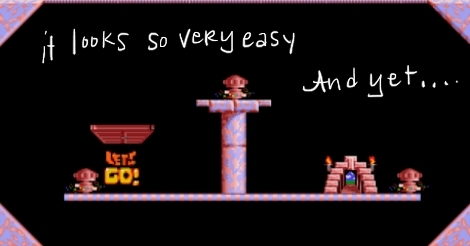 Amanda: I don’t want to sell my soul just for a lemmings level, but it is getting close to that kind of desperation. It is the saddest day. After my white hot rage, I found myself in the throes of denial. Certain that my constant failure had nothing to do with ME, I was creating an alternate universe in my mind where the game simply did not work. There was one single grain of possibility that this was the case, and I planted that grain into the fertile soil of my strained imagination. It began to sprout into a lovely plant which would later be harvested for nourishment, and it would have if I had not continued playing. Amanda: I am certain that this is just broken. Why the F WORD would one lemming land and then walk the opposite direction?! The direction NO OTHER lemmings are walking in?! Amanda: Just to go into the meat grinder! WHY!?! No. This is more than that. This is a PLOT. A plot to drive me into the Devil’s arms!!! Although I imagine that if I summoned Satan and he tried to get past this level, he, too, would be thwarted. Because it is BROKEN AND IMPOSSIBLE! Billy: Who would the devil turn to? Amanda: The devil would break my computer take my soul and be in a bad mood for the rest of the day. Amanda: OHHHH. I JUST WON IT. … I didn’t sell my soul did I? Now I am worried. Billy: You may have… You may very well have. Though if you sold your soul you would have beaten the level. Amanda: What? I DID beat the level. I feel like I have climbed a mountain. Billy: Oh no! Enjoy this life while you can. You’ve done the unforgiven. I must go. I don’t want to be anywhere around this. That’s right. I DID beat that god forsaken level! It was a sudden, unexpected victory and I was left feeling not entirely satisfied. I do not recall signing any infernal contracts in my own blood, nor making any bad kinds of promises, so I don’t THINK I actually sold anything like my soul to anyone like the devil. 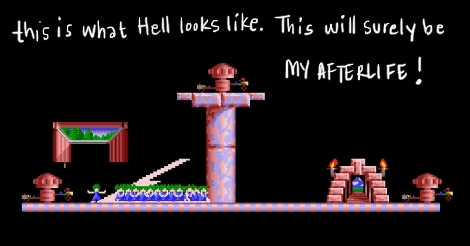 I suppose I will find out for certain in the Hereafter, but I will be VERY disappointed in myself if I did such a thing over a Lemmings level, no matter how difficult it was.